My feet look wonderful. They are beautiful. I could not be happier. I am now able to wear my heels. Fiodaliza had both bunions correct with Dr. Blitz’ Bunionplasty® and she is very happy with the look and function of her feet. She was walking immediately after the surgery and is not back to wearing heels. Hi! I’m Fiordaliza, I had bunion surgery two months ago and I could not be happier. My feet look wonderful, they are beautiful and I could not be happier. I am now able to wear my heals and everybody wants to know who did this. So I get to show people. People actually want me to take my shoes off to show them Dr. Blitz work. I could not remember a time where I didn’t have bunions and pain in my feet. So I’ve had them for most of my life I would say. Now I am elated. No more pain! I was able to walk immediately after I came out of anesthesia, then I went home and had lunch. That was great. Recovery was really easy. I paid attention to what Dr. Blitz said. If you’re considering bunion surgery I have to tell you that Dr. Blitz would totally make you feel at ease and relaxed because he explains every step of the way. So that for me was the one thing that made me feel comfortable. I want people to understand that it’s not as crazy as some people think it is. It’s really an easy surgery to experience. The staff here in Dr. Blitz office is amazing just as he is himself. Very caring, warm, loving and genuine which is amazing to me. I was able to find someone that cared so much. I felt the love in this office. There is nobody else to go to but Dr. Blitz. His technique allowed me to walk the next day after surgery. 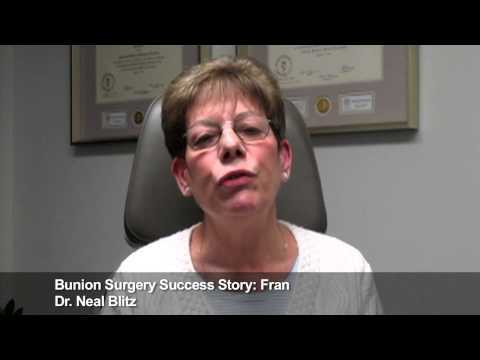 Fran had severe bunions corrected by Dr. Blitz with the Bunionplasty® procedure and was walking immediately after surgery without crutches or casts. She is extremely satisfied with her beautiful feet and says Dr. Blitz is the best bunion surgeon Manhattan. Hi, my name is Fran and I had Bunion Surgery with Dr. Blitz. I had my right one and then my left one. And… completely happy with the job. If you’re looking for a foot doctor, there is nobody else to go to but Dr. Blitz. I really mean that. There is nobody else to go to. My big toe was going over the second toe on my right foot. It literally looked like I had 4 toes. You never saw the second toe and I used to get spacers because on my job, I have to stay on my feet for 8 hours and that was the only way I could do it and Dr. Blitz fixed it so I don’t have to do that. 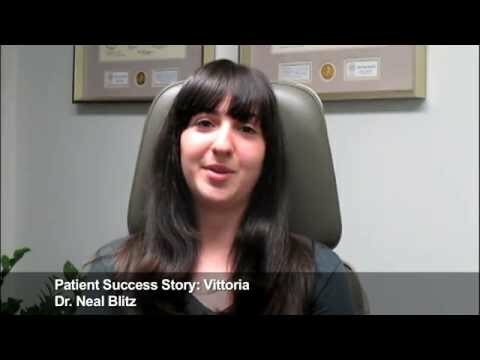 Dr. Blitz’ technique allowed me to walk the next day after surgery. I had made an appointment with a local podiatrist and my daughter did not like him. So she went online, fount Dr. Blitz and brought me here, which was the best thing she could have done. The first doctor explained to me what his procedure was going to be and I would of had to been in a cast and crutches for 6 weeks. When I met with Dr. Blitz, he explained his technique which would allow me to get up the day after surgery. My bunions are in a class considered severe. I am 65 years old. Probably by the time I was in my late 20’s, the bunion was staring to get bad and I basically didn’t look at my feet. I never went for pedicures because I always had my feet covered. And now is the first time, I actually show my feet to people because I don’t have a bunion there anymore and they are beautiful. The one thing I was afraid of the first time I had my first foot done was everyone said, a lot of customers in my store, that it was going to be the most painful thing you ever went through. And I was literally surprised. Dr. Blitz, I can’t say enough good about him and his office manager, there is nobody like her. She goes out of her way to do everything. Every question you have. She was on vacation when I had my first one, the first week there and she called me from Florida. Nobody does that. I can’t say enough about this office. Dr. Blitz really gave me my feet back. I couldn’t stand on my own feet before. I really couldn’t and now I can. He’s perfect. Kimberly had previous hammer toe surgery that resulting in severe shortening of two of her toes, that was both painful and unsightly. Dr. Blitz performed the best revision hammer toe surgery to lengthen her toes and she is very happy with the result and is no longer embarrassed about her feet. Hi, my name is Kimberly and I’m a patient of Dr. Blitz. I came because I wanted to lengthen my toes that were short and he did a great job. The prior surgery I had, they were left really short. Noticeably short and I did not like it. I was embarrassed. I wouldn’t wear sandals. I didn’t want to show my feet because they were very noticeable. Actually, as soon as I got off the cast, I was so amazed. I just showed my feet. I wore sandals, I wore slippers. I wasn’t ashamed. I wouldn’t keep looking at it anymore. Nobody noticed anything wrong with my feet as before they would ask me if I was born with short toes and things like that. No one noticed a difference. It was great. It was perfect. I found Dr. Blitz online. I Googled the best New York City foot doctor and his name came up. Yes, I would recommend Dr. Blitz to everyone. I recommend him to everyone who has issues with their feet. Anything, toes, anything… I recommend him to everyone I know that needs something done to their feet. 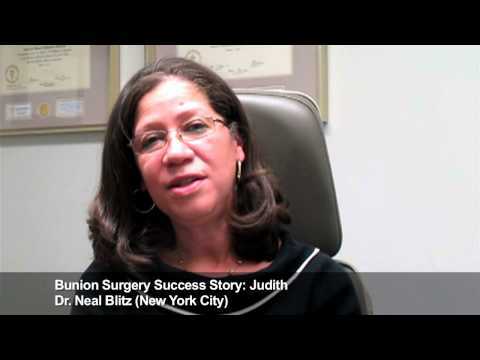 Judith underwent Bunionplasty® Bunion Surgery on both feet. She was walking after the surgery with a small surgical bunion shoe (No Cast No Crutches™). She is happy with the results – both looks and function. Hi, my name is Judith. I had Bunion surgery done to both of my feet by Dr. Blitz. I had been searching a long time for a surgeon and I saw one surgeon before Dr. Blitz and when I found him I realized he was the right person because I was trying to get it done the non-invasive way. Dr. Blitz is a great doctor. His bed-side manner is unbelievable. He is a great surgeon. He makes you feel very comfortable before and after surgery. He is very attentive. After the surgery, I was wearing a small surgical shoe for about 6 weeks and my feet look great. I’m thrilled with the results. Anyone around the world, I would strongly suggest you fly to this country and come to Dr. Blitz. I feel happy with the results.... they really look and feel beautiful." Nicole had hammer toe surgery with Dr. Blitz and is very pleased with how her feet look and feel. She is back to wearing her favorite shoes all around New York City. My name is Nicole and I had hammer toes surgery with Dr. Blitz On my left and my right foot. I was up and back to my “normal” daily activities a couple days later. I enjoyed the people in the office and felt like I was part of the family. I enjoyed the outcome of my surgery on both of my toes. Currently its winter here in New York City and I’m wearing closes toed shoes with no problem. It’s been about 6 months from the 2nd surgery and about 7 months from the 1st surgery. I love my shoes! They feel so much better. I’m not in pain anymore when I wear my shoes. I can wear any shoe that fits… looks amazing on my foot. I feel happy with the results. I love getting pedicures now and I love showing my feet now. They really do look and feel beautiful and I’m very pleased with the results and Thank You Dr. Blitz. I found Dr. Blitz on Google. I typed in best podiatrist in New York City and first an advert came up that was Dr. Blitz. My google search and my experience really do meet and live up to the expectation to being the best podiatrist in New York City. Dr. Blitz is an amazing podiatrist. He’s very professional, very courteous, and very down to earth. He was always on time for our appointments, even if I was not. He did an amazing job. You can barely see the scars on my feet. The office manager, Cheer Alvarez is amazing. She is very accommodating both with myself or the questions that I have had or helping me with my insurance company or scheduling me for an appointment when we couldn’t get our schedules to synch. The experience overall has just been wonderful. I give it an A+. If you have to travel for foot surgery, I would definitely recommend the staff and Dr. Blitz here. I think that beyond the quality of care that the service you get from the team also makes it world class and worth coming here for.